After the last Virginian snow-storm on the February 18-19 weekend, many declared winter over. In a way, it's hard to blame them. Temperatures reached well into the 60s and 70s over much of Virginia. We have had two storms produce strong storms for much of Virginia. In another way, come on, this is Virginia. This is how the weather typically behaves in March as we experience a battle of spring vs winter causing a roller coaster like no-other. I didn't bite into that nonsense that snow was over for Virginia. I'm now ruling the two events at the end of this weekend winter's last stand. I may look back in a few weeks and realize that I too jumped the gun on declaring winter over, although not as soon as some. Come on its March. These things happen every year. We have a significant warmup, rain, sunshine, snow. Last Sunday I posted about the chance of a coastal low forming along the trailing old front of a Great Lakes' Cutter as our best possibility of seeing snow this time of year. Well we had our Great Lakes' Cutter which brought rain to all of the area last night into this morning. The trailing cold front remains stretched out over the southeast at this time, setting the stage for the first of the possible two snow-producing events late this weekend. Here's the current radar from Saturday 1230PM. To our north is the Great Lakes' Cutter. 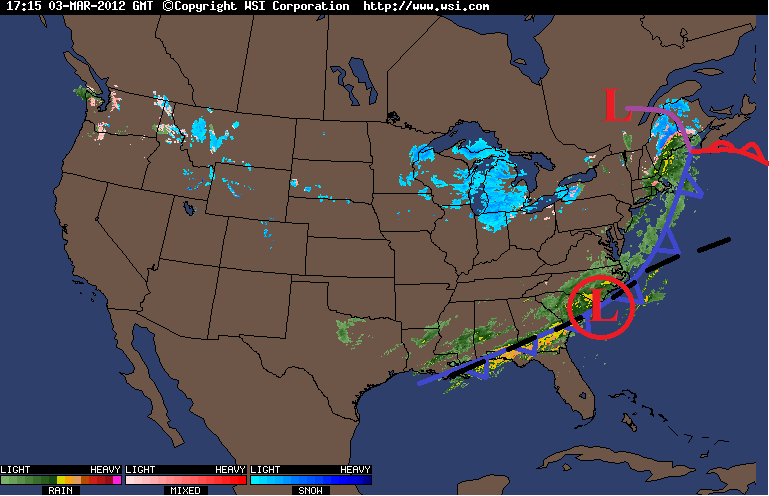 We will have to watch for an area of low pressure (circled in red) to form along and ride the trailing cold front. I'm going to post each of the 12z model runs to show you an idea of what may happen. The CMC is definitely the warmest of the 4 models I showed. I think there will be some wet snow mixed in with the northern fringe of this system. Here is where I think the best chance for some rain/snow mix will be. The question mark is concerning just how far north and west the precipitation can get. If it can get just 25-50 miles farther west of where models have it now (gfs is closest), then there could be a bit more of a snowier northern fringe. I still don't expect much by the way of accumulation. Our attention will then turn to a clipper swinging through the area Sunday night. This will have much colder air to work with, and will be coming during prime time night hours. 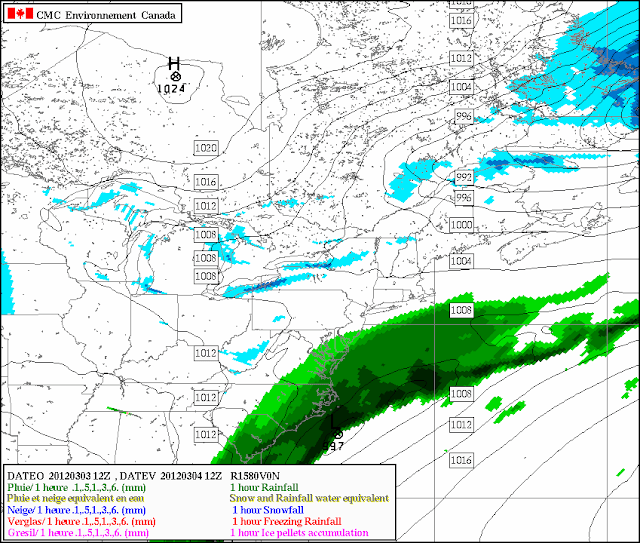 The first model I'm going to show is the 12z nam, which is the farthest south and weakest of the models. As you can see, this ends up just being a few light snow showers/flurries and not a big deal for anyone. 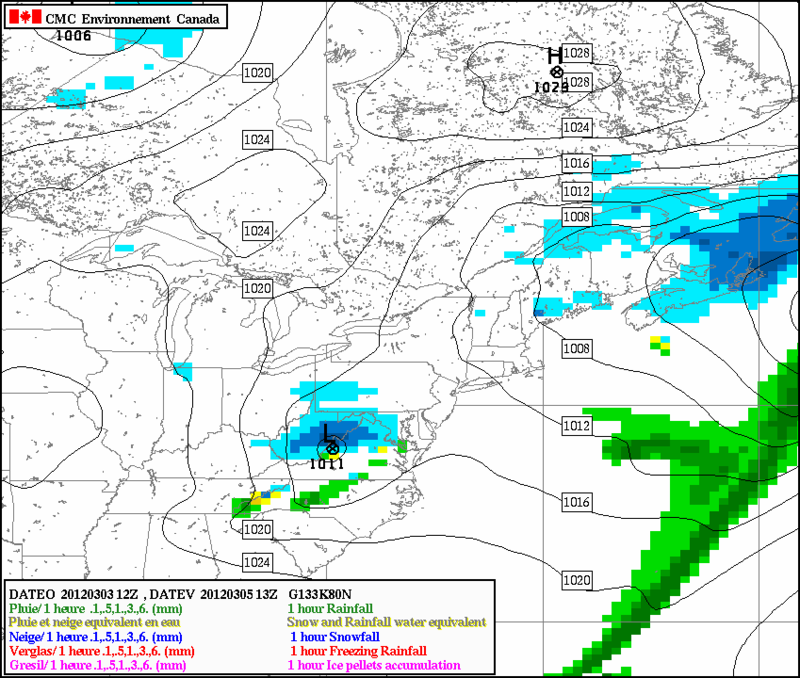 The 12z gfs shown below is a bit farther north and a bit stronger with the clipper. Nice analysis. I took a peek at the 00z NAM and GFS runs. In the mtns near Front Royal, looks to me like the first event will miss but maybe some light snow from the clipper... thoughts?